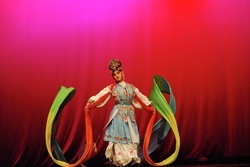 This unit with be using Beijing (Peking) Opera techniques and looking at how to apply them to a piece of text - in this case the Monkey King. We will have an expert on Beijing Opera - Mr Guan working with the students for four lessons to teach them certain gestures and skills. The skills include - walking as a male and female character; stick fighting; and sword work. The student will then examine a section of the "Monkey King" and explore how to use these skills to bring the story to life. The students will create and perform their version of the "Monkey King"